Subrahmanyan Chandrasekhar was an astrophysicist and Nobel laureate. His research interests included stellar structure, white dwarfs, stellar dynamics, the theory of radiative transfer, general relativity, and black holes. He was also the Morton D. Hull Distinguished Service Professor of Theoretical Astrophysics at University of Chicago for many years. October 19, 1910Birth (Lahore was then part of British India), Lahore (Pakistan). 1930Obtained BA, University of Madras, Chennai (India). 1933Obtained PhD in Theoretical Physics, University of Cambridge, Cambridge (England). 1933 – 1937Fellow, Trinity College, University of Cambridge, Cambridge (England). 1937 – 1995Research Associate (1937-1938); Assistant Professor to Professor (1938-1946); Distinguished Service Professor of Theoretical Astrophysics (1947-1952); Morton D. Hull Distinguished Service Professor of Theoretical Astrophysics (1952-1985); and Morton D. Hull Distinguished Service Professor Emeritus (1986-1995), University of Chicago, Chicago (Ill.). 1951 – 1954Member, Council, American Astronomical Society. 1952 – 1971Editor, The Astrophysical Journal, University of Chicago Press. 1964 – 1968Member, Council, American Physical Society. 1966Awarded National Medal of Science. 1974Awarded Dannie Heineman Prize for Mathematical Physics, American Physical Society. 1979 – 1981Member, Advisory Board, Institute for Theoretical Physics, University of California, Santa Barbara. 1983Awarded Nobel Prize in Physics "for his theoretical studies of the physical processes of importance to the structure and evolution of the stars". August 21, 1995Death, Chicago (Ill.). Ph.D. advisor at University of Cambridge. Advised by Chandrasekhar at University of Chicago, "The effect of magnetic fields on the generation of noise by isotropic turbulence." Obtained PhD (Theoretical Physics) in 1933. Fellow, Trinity College. Research Associate; Assistant Professor to Professor; Distinguished Service Professor of Theoretical Astrophysics; Morton D. Hull Distinguished Service Professor of Theoretical Astrophysics; and Morton D. Hull Distinguished Service Professor Emeritus. Member, Council. 1974 Dannie Heineman Prize for Mathematical Physics Recipient. Obtained BA (Physics) in 1933. Banquet of the American Physical Society and the American Association of Physics Teachers [sound recording] / 1974 February 5. Edward Arthur Milne: Recollections and reflections, 1976. General interest session [sound recording] : Cosmic physics ; 1974 February 5. Joint ceremonial session of the American Physical Society and the American Association of Physics Teachers [sound recording], 1969 February 4. Joint symposium of the Division of Astrophysics and the Forum for History of Physics [sound recording] / 1987 April 21 & 22. Letter to Gerard Peter Kuiper congratulating him on his recent astronomical discovery, 1944. Oral history interview with Subrahmanyan Chandrasekhar, 1987 October 6. Subrahmanyan Chandrasekhar holograph manuscripts, 1931-1938. American Astronomical Society Historical Astronomy Division addition to records: obituary files, 1995-1998. Correspondence relating to the posthumous publication of Ramanujan's notebooks, 1917-1940. Dedication of McDonald Observatory at Fort Davis, Texas [motion picture] / taken by Peter Van de Kamp. E. G. Ebbighausen response to History of Modern Astrophysics Survey, 1980. Edward Milne papers and correspondence, 1916-1976. Eugene N. Parker response to History of Geophysics Survey, 1997. H. P. Robertson papers, 1922-1980 (bulk 1936-1966). Kip Thorne interviews conducted for his book "Black Holes and Time Warps," 1980-1989. M. N. Saha correspondence, 1920-1954. Oral history interview with Albrecht Unsöld, 1984 February 24. Oral history interview with Aleksei Aleksandrovich Kozyrev, 1987 December. Oral history interview with Ellen Dorrit Hoffleit, 1979 August 4. Oral history interview with Esther Conwell, 2007 January 22. Oral history interview with Geoffrey R. Burbidge, 1974 November 15. Oral history interview with Guido Münch, 1977 July 7. Oral history interview with Gunnar Randers, 1986 August 19. Oral history interview with Halton Christian Arp, 1975 July 29. Oral history interview with Harry Hemley Plaskett, 1978 March 29. Oral history interview with Jeremiah P. Ostriker, 2002 May 14 and 21. Oral history interview with Jesse Leonard Greenstein, 1977 April 7, July 21, 26 and 1978 May 19. Oral history interview with Margaret Burbidge, 1978 July 13. Oral history interview with Pierre Demarque, 1977 February 21. Oral history interview with Robert Marshak, 1970 June 15, 16, September 19, and October 4. Oral history interview with V. A. Ambartsumian, 1987 October 2. Oral history interview with W. W. Morgan, 1978 August 8 and 9. Oral history interview with William A. Fowler, 1983 May 3 - May 31, 1984. Oral history interview with Yoshio Fujita, 1997 August 26. Otto Struve selected correspondence [microform], 1932-1945. Sir William Hunter McCrea papers and correspondence, 1890-2004. A quest for perspectives : selected works of S. Chandrasekhar : with commentary / editor, Kameshwar C. Wali. An introduction to the study of stellar structure / by S. Chandrasekhar. Eddington, the most distinguished astrophysicist of his time / S. Chandrasekhar. Ellipsoidal figures of equilibrium / S. Chandrasekhar. Hydrodynamics and hydromagnetic stability / S. Chandrasekhar. Marian Smoluchowski : his life and scientific work / by S. Chandrasekhar, M. Kac, R. Smoluchowski ; [edited by] R.S. Ingarden. Newton's Principia for the common reader / S. Chandrasekhar. Plasma physics : a course given at the University of Chicago / by S. Chandrasekhar ; notes compiled by S. K. Trehan. Principles of stellar dynamics / by S. Chandrasekhar. Radiative transfer / S. Chandrasekhar. Stellar structure and stellar atmospheres. The mathematical theory of black holes and of colliding plane waves / S. Chandrasekhar. Theoretical principles in astrophysics and relativity / edited by Norman R. Lebovitz, William H. Reid, Peter O. Vandervoort. Truth and beauty : aesthetics and motivations in science / S. Chandrasekhar. "Chandra: A Biographical Portrait," Physics Today 63 (2010): 38-43. 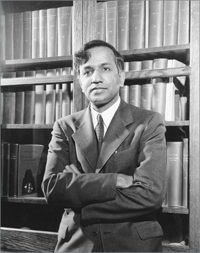 "Chandrasekhar's Role in 20th-Century Science," Physics Today 63 (2010): 44-48. "Some Memories of Chandra," Physics Today 63 (2010): 49-56. Chandra: A Biography of S. Chandrasekhar (Chicago: University of Chicago Press, 1991). From white dwarfs to black holes : the legacy of S. Chandrasekhar / edited by G. Srinivasan. Subrahmanyan Chandrasekhar Physics Today obituary. Subrahmanyan Chandrasekhar: 1910-1995, Biographical Memoirs of the National Academy of Sciences. The mathematical theory of black holes / S. Chandrasekhar.